The Turmberg is a favourite destination for outings and can be reached by a number of routes. The Turmberg railway has been ascending the hill since 1888. It is the oldest funicular railway still operating in Germany. The top of the hill can also be reached directly by climbing the 528 steps of the “Hexenstäffele”. Awaiting you at the summit is a wonderful view across the Rhine Plain over the rooftops of Durlach and Karlsruhe. A number of signposted walks present an opportunity for a tour on foot and there’s also a large adventure playground plus the high ropes course completed in 2010. The Turmberg got its name from an old tower dating back to the late Staufer period. The foundations of a 200 year older tower were discovered right next to it. These are the remains of the “castrum Gretzingen”, i.e. the castle of Grötzingen. The Pinzgau counts of the Hohenberger dynasty had their residence here in the 11th and 12th centuries and exercised governing rights on behalf of the Salier kings. The residential tower was one of the earliest aristocratic highland castles in Germany’s southwest, demonstrating the aplomb of its owners. The old residential tower was demolished between 1230 and 1250 and a slimmer castle-keep integrated into the enclosing wall instead. 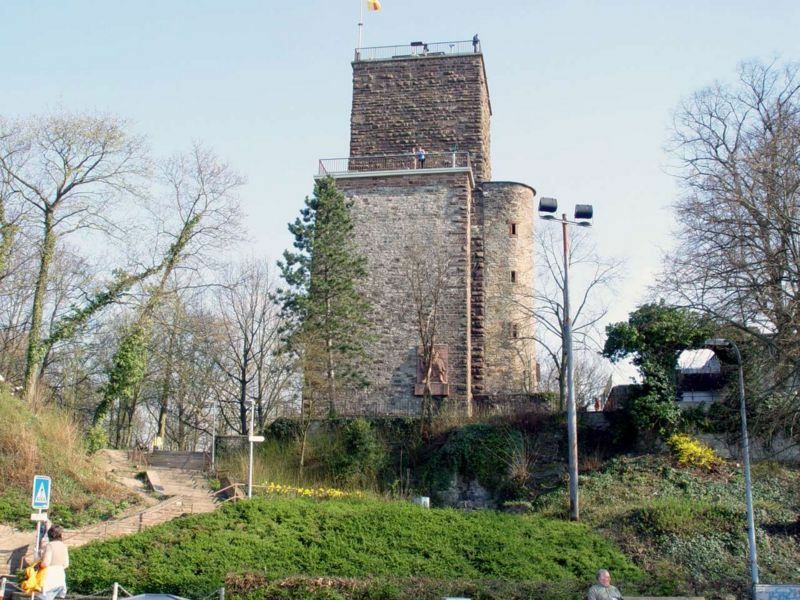 The 28 m high tower of today is characterised by the robust and defensive-looking ashlar masonry typical of the Staufer period. The new masters in the 13th century, the margraves of Baden, initially still held office in the castle, then called “castrum Durlach”, from time to time. As this was captured on several occasions in the 1270s, however, they increasingly preferred the town of Durlach in which they built a lowland castle. When margrave Karl II. Moved his residence there in 1556 and had the Karlsburg built, the old castle was retained as a watchtower. With the aid of a 13 m high pillar, a platform was built to accommodate an alarm cannon.